I have taken a lot of art classes in the last few years with some incredible teachers. This has always mean leaving Birmingham, which isn’t exactly a haven for altered artists. 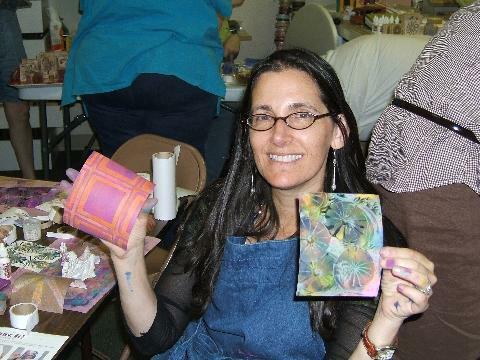 But yesterday afternoon, a local stamp store offered a short class with Mary Jo McGraw. My goofy friend Susan (I have to say that, because she refused to be in a picture saying "no, you’ll just put it on your blog and say ‘this is my goofy friend Susan’") told me about this class a couple of months ago and I have been looking forward to it ever since. I’m just going to have to say that Mary Jo is an incredible teacher and try to leave it at that because otherwise I would go on and on and on. She’s smart, she’s practical, she’s funny, and she’s a great teacher. I’m going to make a point of taking as many of her classes as I can from now on! Here is a picture of me towards the end of the class. In my left hand there is a print using Color Box chalk re-inkers to create Madras inspired backgrounds. The right hand is a mono-print done using the same reinkers and rubber stamps — definitely a technique I’ll be using a lot. And I was so happy that Mary Jo showed a lot of new ways to use one of my favorite products, Microglaze. Sounds like so much fun!! I’ve never taken a class with Mary Jo McGraw, but I’ve watched several DVD’s and I would love to meet her in real time. I love what you did—how about a mini tutorial on the one with the stamps?? PLEASE 🙂 And microglaze is one of my very favorite products—please share new ideas.